When Fashion and Nature Collide – Flowers August 2018. I get so much pleasure from these collaborations, and from our friendship. This month has an ocean theme. The outfits are all styled and modelled by our own lovely Dominique of 3C Style and many of those photos were taken on her summer vacation to Mexico. As you can see from Lisa’s art, Dominique makes a good mermaid! These flowers and Roda‘s critter photos have provided the inspiration for Dominique‘s styling and Lisa’s art this month. Please go and visit their own blogs and see their posts. Collages used here were prepared by Roda. Above cartoon and hats collage by Lisa. Fashion Inspiration by 3C Style, Flower photography by Darren, collage compiled by Roda. This Lily relative is native to California in the USA. Most Calochortus have upward facing tulip-like flowers. C. albus var rubellus is one of a group of species with pendant bell-like flowers known as the ‘Fairy Lanterns’. Normally C. albus is white but var rubellus occurs in shades of pink/peach. This is a fairly easy plant to cultivate provided the bulbs have a dry summer rest. Calochortus dislike a lot of moisture so I grow most of them in unfeasibly small clay pots. They seem to like this. Very few Calochortus are commercially available as bulbs and are generally raised from seed. Germination is usually good but seedling mortality after germination is notoriously high. H. oligantha is a much smaller species and is winter-growing, dying back to a dormant corm in the summer after flowering in spring. I find it very easy in a small pot under frost-free glass and it produces copious seed – to the point where I keep a careful eye on it for seeding into other pots nearby. There are 11 species of Anigozanthos and numerous hybrids and cultivars. These are all Australian plants and are commonly grown for the cut flower trade – which is how we usually see them here in the UK. They are grown in mild areas and as pot plants also. They are very drought resistant. The photo above was of an unlabelled specimen in a pot in a public garden in England. ‘Kangaroo Paw’ comes from the shape of the furry flower buds. I have to hold my hand up here and confess that I have never grown Hibiscus. It is a huge genus but this unknown variety, photographed by my wife Susan at Bodnant in North Wales, seems to be a variety of Hibiscus rosa-sinensis which originated in East Asia. There are myriad cultivars and hybrids! I wrote about Ranunculus asiaticus in detail in this previous edition. This photo shows plants with two different shades of red in the forground. The front one is actually quite purple but impossible to photograph accurately! The ‘picotee’ flower behind is the result of crossing red and yellow forms of the species. Sometimes known as the ‘Chilean Blue Crocus’, though the resemblance to Crocus is coincidental. This plant has a fascinating history in cultivation. The current cultivated stock has been maintained by specialist gardeners since before the Second World War. It was native to the Andean foothills in Chile where it was apparently rendered extinct, largely as a result of agriculture. …until 2001 when it was rediscovered in the wild after decades of ‘extinction’. Interestingly, the species in cultivation produces forms (var leichtlinii) in which the flower is largely white with the blue being confined to the outer part of the petals. If anything it is more beautiful than the solid blue. There is also a violet form. Much to the surprise of many – the rediscovered wild population closely resembles var leichtlinii and has no solid blue specimens. So maybe what we think of as the normal blue form is actually a horticultural selection and it is the rarer var leichtlinii which is ‘normal’? Previous The career change car insurance saga. Next Another 7 day B&W photo challenge! Day 1.. Thank you Lisa. It is great for me to see my images put to such good use. I am in awe of your talent. I love all these flowers Darren but I think the blue of the Chilean Blue Crocus would be a my favourite. You guys are such a terrific team. The blue crocus is my favorite! That color-wow!! 💚 Love and hugs, Super D! That blue seems to be a hit alround! Thank you so much😄. 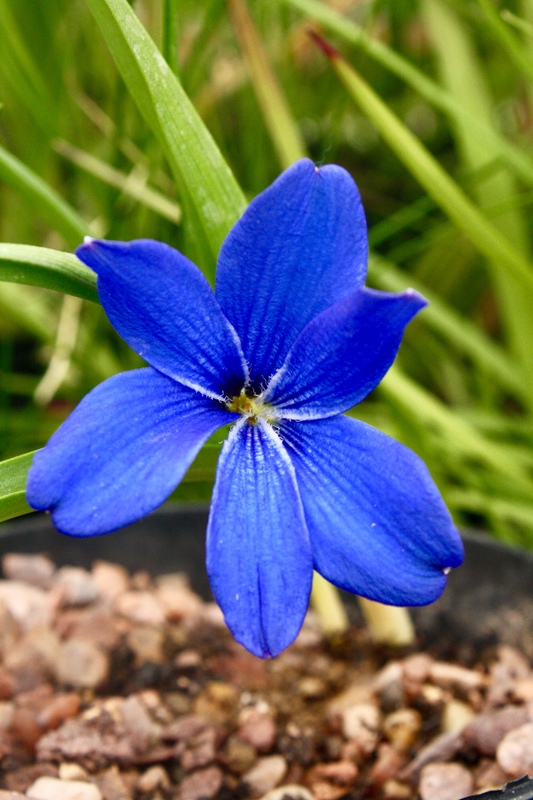 It is regarded as one of the purest blues in the plant kingdom. Corms are easily available from bulb specialists but are expensive at around 4 to 6 pounds each. I think they might just be worth it. Good morning Darren, what a tremendously colourful and vibrant post, superb photographs. Yay! You will be great. I just know it. Big hug dear friend. I did sleep. I just woke up. I’ve got to be at work early today. Have a fabulous day! As allways, beautiful and inspiring. I have been investigating this already. I had toyed with upgrading my WP plan to premium to allow me to host videos but then I figured I could put them on youtube for free and link to them just as I did with Ian’s. Thank you. Dominique had asked me to look out fir a peach coloured flower so when Susan was going on a trip to Bodnant gardens in Wales I asked her to have a look. She spotted the hibiscus and took a great picture. Fish, flowers and fashion…brilliant!!! Those colors are out of this world!